In a sense, R&J are still here - in their offspring. 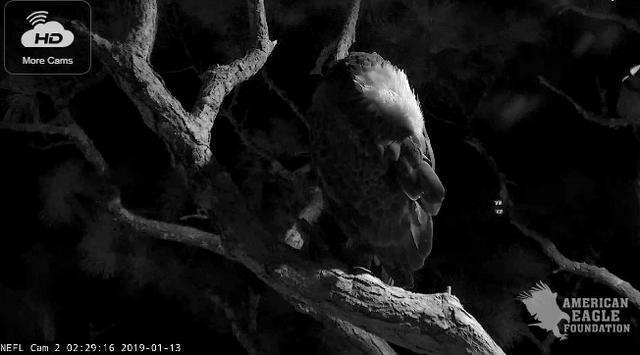 Samson and his Bachelorette #2 mate spent the night tucked close together on a branch. 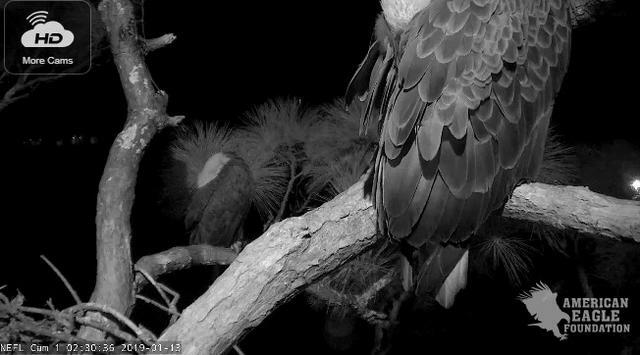 5.30 am Finds Bachelorette #2 in the nest poking around. I have a feeling Samson met and courted this girl before we knew she existed. 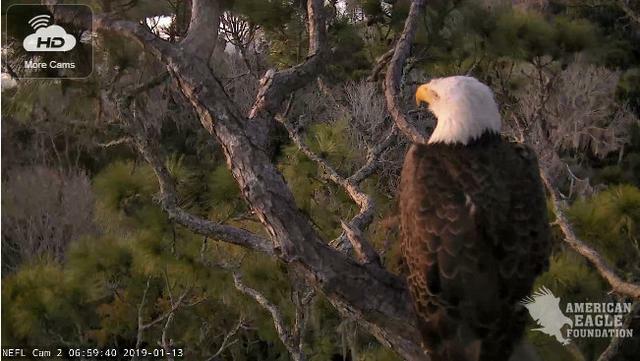 Thanks Nadia, I didn't know they thought Delilah had visited the nest in recent years. Isn't it wonderful to know Samson and Delilah both made it not only through that rough 1st year, but made it to adult/subadult years!! Bachelorette #2 spent the night tucked in the nest. 6 am Is she going to lay an egg?!? 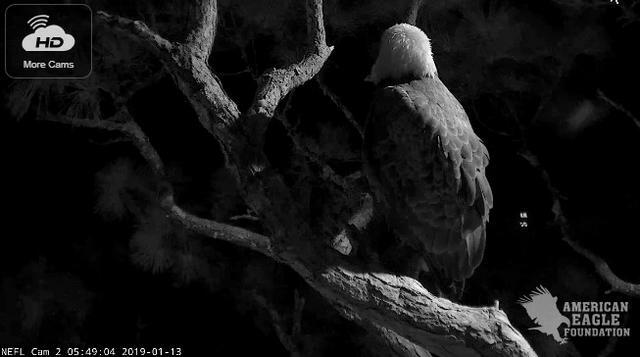 Glad she was in the nest overnight. When I left last eve, each was on a branch on opposite sides of the tree. It's terrible viewing for me this morning with all the spinning or freezing of screen. Noticed chat was experiencing same. 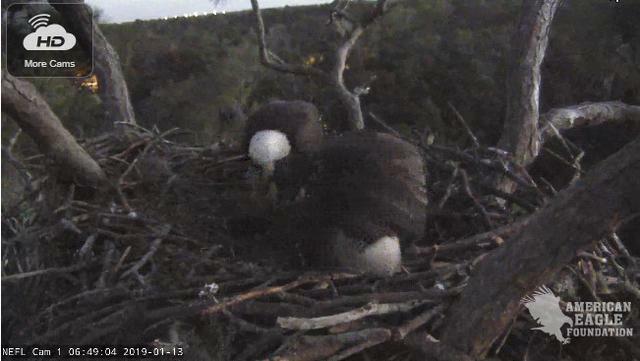 Noticed yesterday on chat AEF Mod said it is not too late for a successful nesting season here. 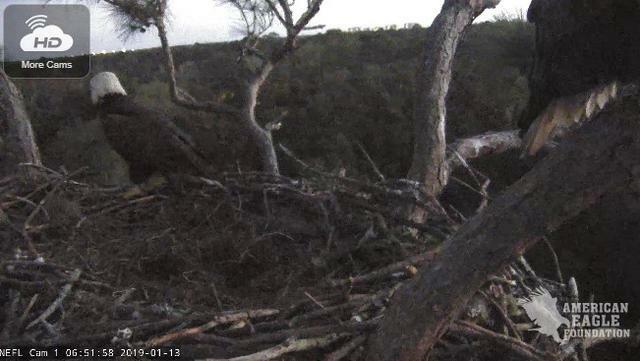 at 6:49pm both are perched in tree. I only ever did just check in on thi s nest so I will continue to check. 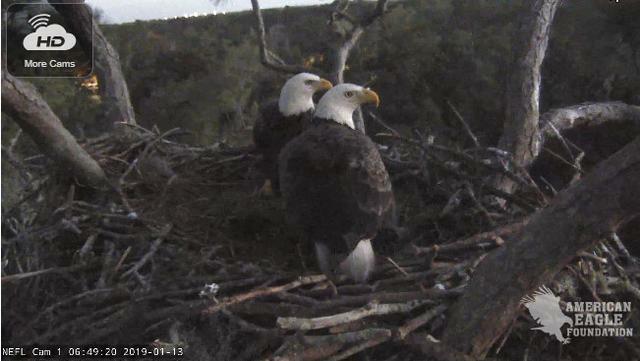 Male: Samson & Female 2: "Bachelorette"
Copyright© American Eagle Foundation, EAGLES.ORG. 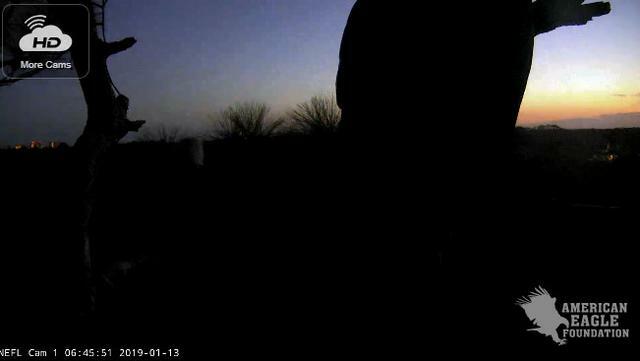 mod - 5:10 am vocals exchanged as a barred owl is heard in the distance. They sure seem closely bonded. I stick by my earlier opinion they met while we only saw Missy - and I still think Missy annoyed Romeo, AEF disagrees. This time I watched them. They looked right and left as they sang. This tree is OUR tree! This nest is OUR nest! 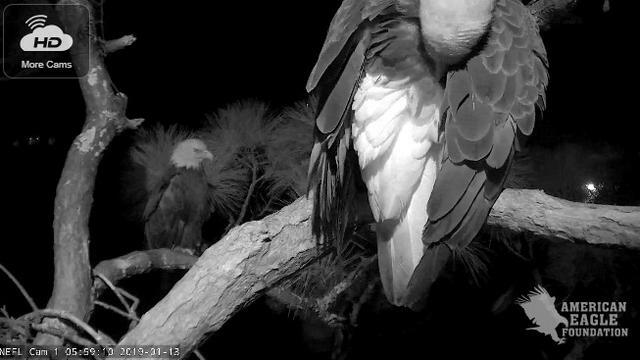 Then they dropped down into the nest together and messed around. I'd like to see them bring in fresh grasses. 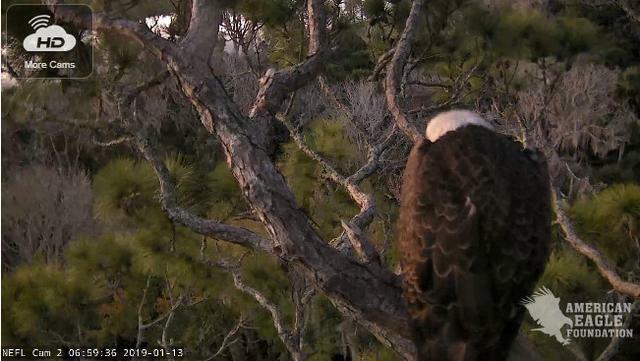 9.30 am Both have flown - but I've heard eagle chatter wafting on the breeze. 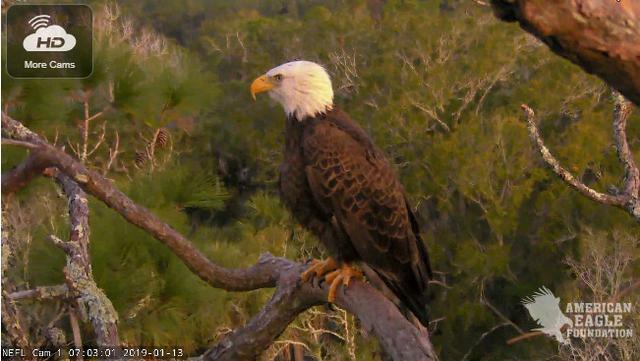 They both left together at 732AM this morning and Samson has returned twice today to perch in the nest tree without her. He is relaxed. He loudly vocalized once while I watched, but I hear no vocals in the distance. 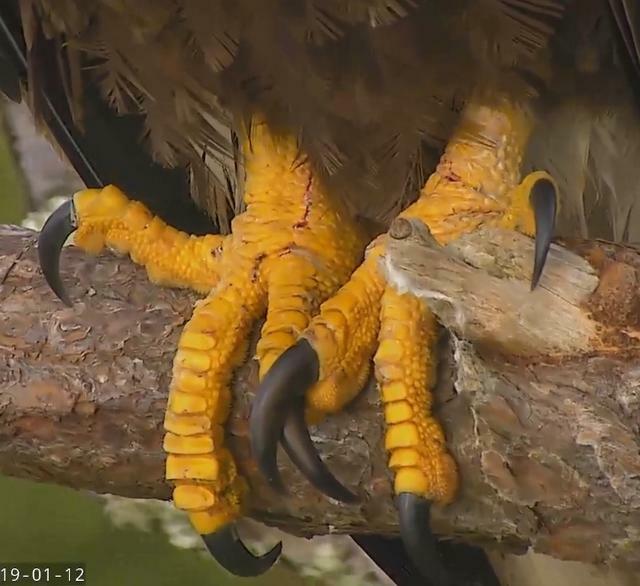 935am - Samson's talons. 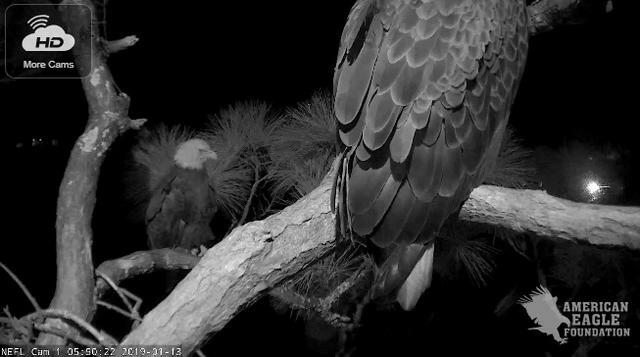 You can see his trademark "flat" spot of the middle toe of his R talon. It is not really a flat toe, but is wider than the other toes. 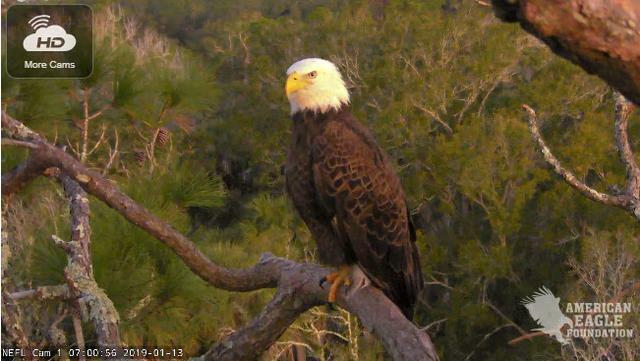 He has some scrapes on his talons - possible war wounds. 936am - Samson - a handsome boy. 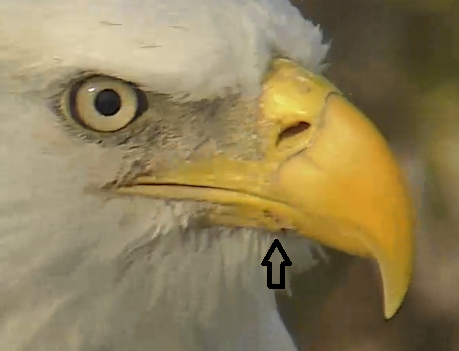 951am - Samson's past beak injury healing nicely. is Samson th e one that was here with the previous female. 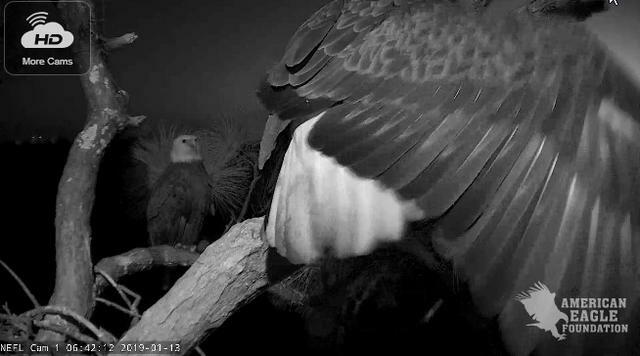 the female with war wounds on talons. He is the one that was twitching???. Hi Bev. Yes, he has had 2 females. 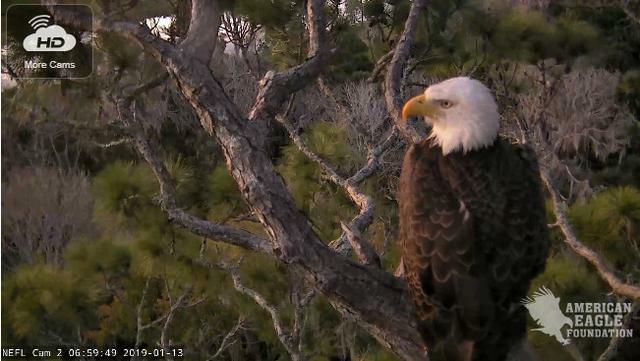 He is same male that is part of the pair that arrived on 12/28. He is a 2013 hatch of Romeo and Juliet. 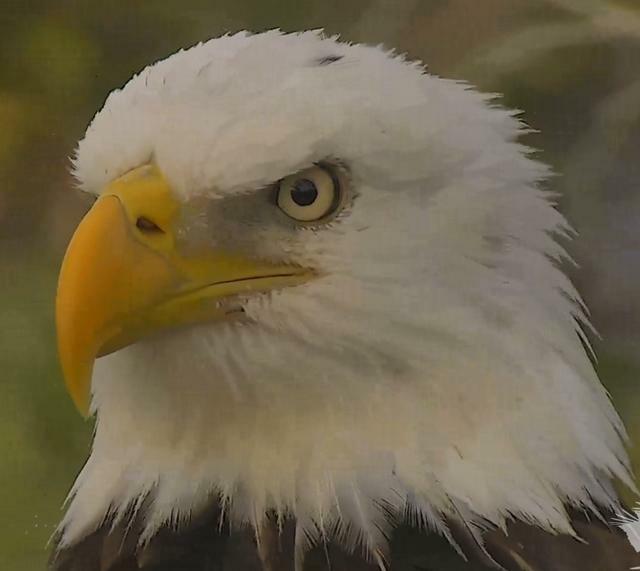 AEF identified him by his talon, which Juliet stepped on when he was a few weeks old. 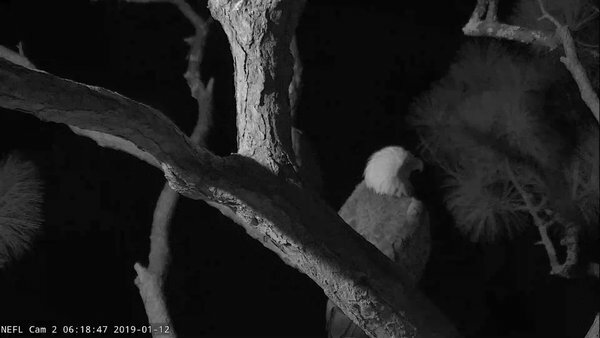 He was spotted at the nest back in July 2018. The 1st female he arrived with has been gone for a few days. Apparently replaced by a new female, F2 that he seemed quite smitten with and mated with. 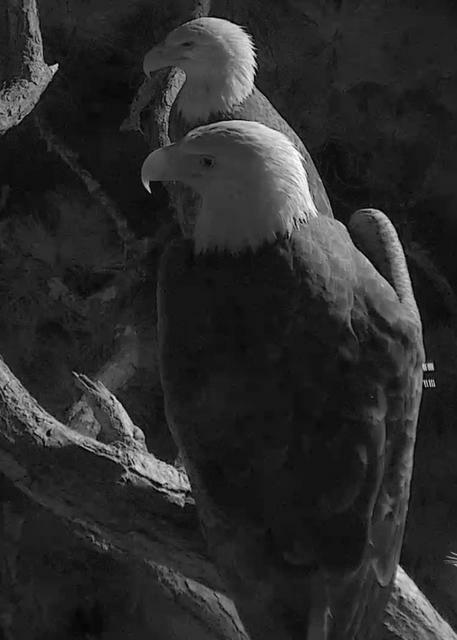 Both have been doing nestorations together and sleeping side by side in the nest tree the past few nights, but she has not been at the nest tree since leaving early this morning. Bachelorette #2 is a lover not a fighter. GOOD. She is really fond of Sam and snuggles with him. 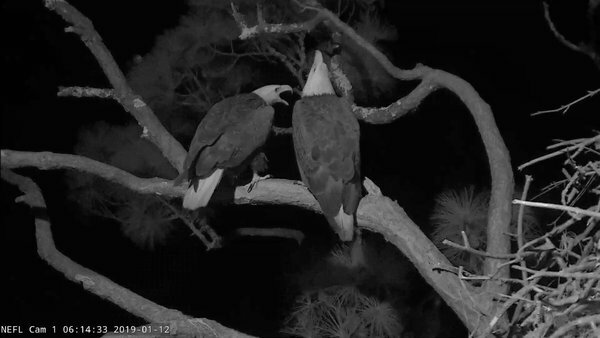 I hear them calling to each other even if not at the nest. This is DEFINITELY their nest now. I doubt we will see any more changes. F2 came home with Samson at sundown. 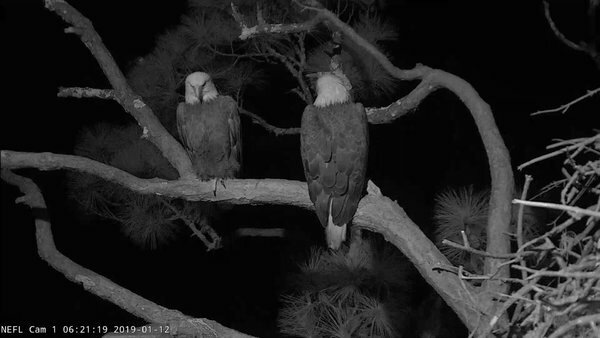 They did some nestorations and are now sleeping side by side in the nest tree. This pair are MATES and this is THEIR tree. It sure looks FINAL to me. loza thats great! WOW! What a catch!